The existing kitchen in this historic home was a dark and crowded 60-square-foot space. 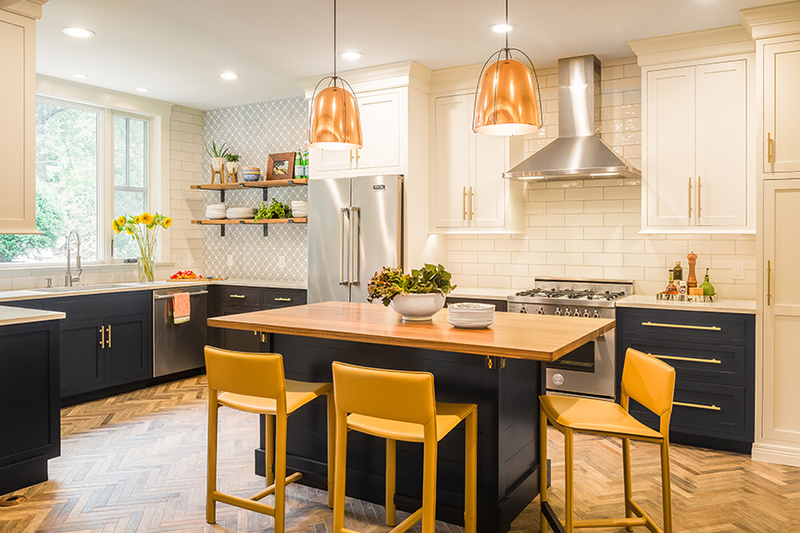 Designer Karr Bick Kitchen & Bath took the out-of-date space and made it work for a modern-day family by combining it with an under-utilized kitchen-table area. To take advantage of the total space, a side window was closed off in the eating area, which created wall space to accommodate appliances and enlarge the work triangle. A radiator was moved to open the entry into the dining room and allow for an island with seating. The designer wanted to be respectful of the age of the house, but also had clients who were willing to be adventurous in their material selections. To achieve an eclectic mix, upper cabinets in a classic white are paired with lower cabinets finished in Inkwell Blue Black. 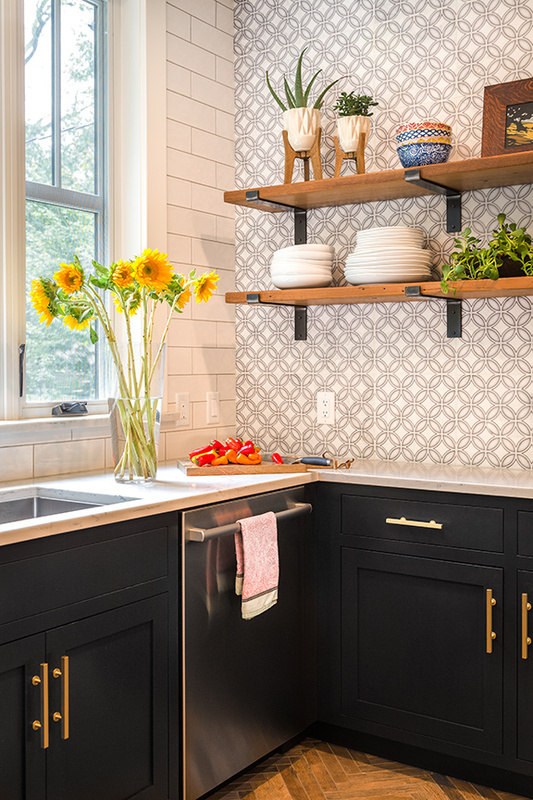 Open wall space is covered in etched marble accent tile and includes reclaimed wood shelves with iron metal brackets. 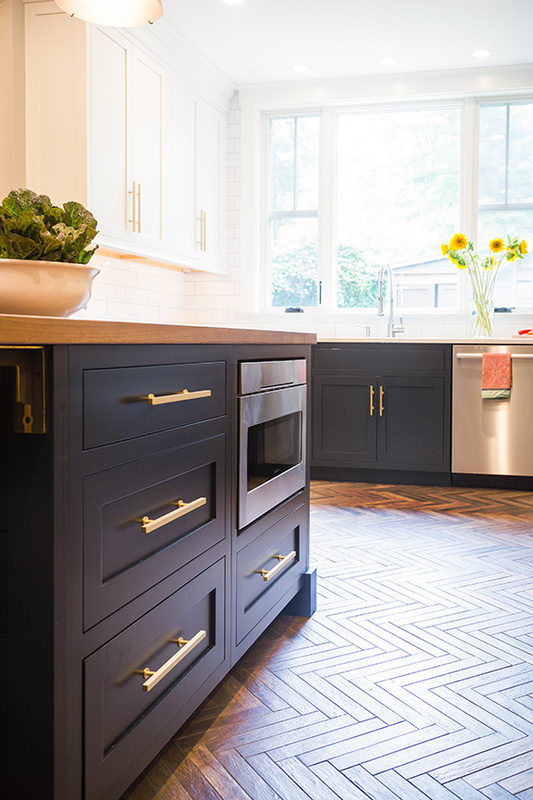 Stainless appliances, copper accent lighting and brushed brass hardware add a mixed metal theme. Classic subway tile in a larger size frames the sink window and adds interest with its wavy texture and gray grout lines. The wood theme is repeated in the walnut countertop on the island as well as the handsome wood-look herringbone floor file. The base cabinet color is so unique. Mixing metals in the space boosts the eclectic feel the designer wanted to achieve.